This is a fundraising item – all profits from the sale of these posters go to support the work of Tripsit.me. This is a limited edition printing run – once they’re gone, they’re gone! It includes a wide range of common and less common drugs and provides a QR link to the TripSit resources for additional research. This 28 x 43 cm poster is intended to be displayed as an educational resource where other advice and information is readily accessible, but can also be displayed as a decorative piece in private places as a symbol of support for the incredible work of the TripSit organisation, which provides 24/7 chatroom support for drug related crises as well as drug information. Find out more on their website: https://tripsit.me/. 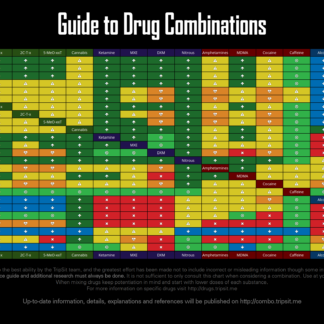 The combo chart is an excellent harm reduction resource which warns people when a drug combination is too dangerous to even contemplate. It must never be used as the sole decision-making tool when deciding to try a substance, but can be used to discourage people from researching or trying potentially fatal combinations. The folded poster is machine folded into thirds to minimise creasing and will be sent in a flat envelope. The unfolded poster will be rolled into a poster tube and sent without creases for ultimate aesthetic appeal.